Review date: 5 April 2002. Joysticks and gamepads have a hard life. Stick-shoving, button-mashing, flinging the game controller to the floor and rolling your wheelie-chair over it when, once again, the schweinhund Engländer in his miserable Hurricane manages to shoot your Me262 out from under you... you know the drill. So, ideally, you don't just want a game controller that has all the controls you need and won't result in your hands being featured as the Horror Of The Month in a journal devoted to soft tissue injuries. 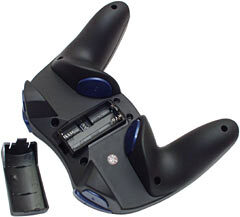 You also need a controller that works consistently and reliably, and will continue to do so when treated with less respect than it deserves. And it'd be nice if it didn't clean out your bank account. And it should look cool, too. Regrettably, joysticks obey Sturgeon's Law. There are lots of game controllers with OK ergonomic styling (well, as far as you can tell when you play with them for two minutes in the shop, anyway), and tons of buttons, and integrated throttle controls, which feel pretty solid. The question is whether the things will last more than a couple of weeks. I was, accordingly, interested to check out this stack of gear from Thrustmaster. Thrustmaster are now owned by Guillemot (Guillemot own Hercules, too), but they haven't changed direction much. They're still making the rather expensive HOTAS control rigs that've made the Thrustmaster brand so popular among simulation enthusiasts. Most people don't want one of those setups, though. They tend to be pretty heavily sprung, as well as excitingly expensive. And they're quite inappropriate for console-style games. To fill the needs of mainstream gamers, Thrustmaster also make a range of "Top Gun" joysticks and "FireStorm" gamepads, and it's some of those that I've checked out. Inside and out. 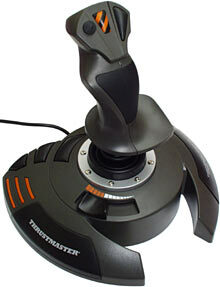 Thrustmaster make quite a lot of joysticks carrying the "Top Gun" name. Apparently there's still considerable cachet in the name of a 16 year old movie of questionable accuracy. Or maybe they just got the license cheap. Anyway, this is the Top Gun Fox 2 Pro USB, which used to cost $AU71.50 delivered from Aus PC Market (however, they no longer sell it), and which shares a lot of features with the other Top Gun sticks. 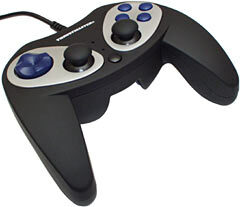 All of the Top Gun models have the same basic stick design, with a curved and comfy grip, hand rest flange, and four-button, one-hat-switch stick top. Like a lot of "ergo" input devices, these sticks are made to suit right handed use only. Tough luck, lefties. 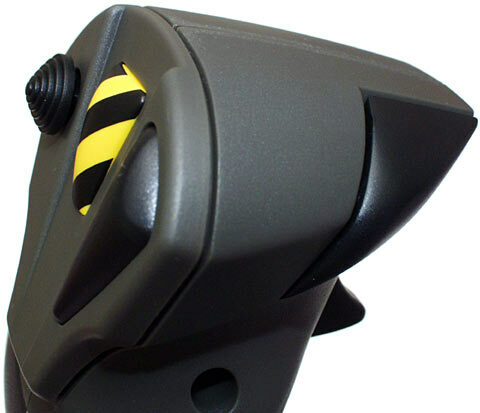 The top of the stick has an index finger trigger, a second index finger button on the right hand side, and two thumb buttons and the eight-way hat switch mini-stick on the back face. 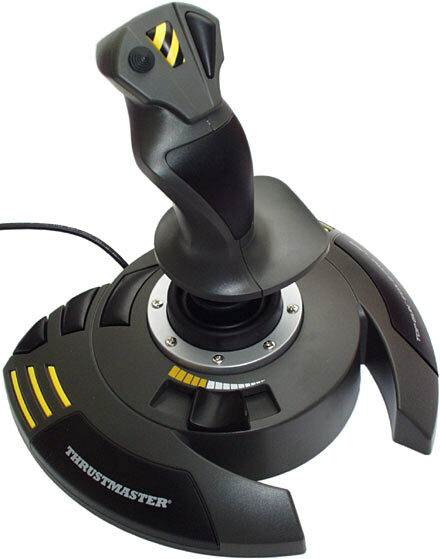 Thrustmaster make more luxurious variants of these sticks that have a "realistic masked Fox 2 button", with a little flip-up lid over it. Here in Australia, though, the "Fox 2" middle button is just a stripey button. "Fox two", by the way, is apparently flyboy jargon for the simulated or actual launch of an infrared guided missile. You may need to buy a different joystick if you want to launch semi-active or fully active radar-homing missiles ("Fox One" and "Fox Three", respectively). I'm not sure. The base of the Fox 2 Pro has the sculpted throttle slider and three more good-sized buttons, all of which are pretty well placed for operation with the left hand. You can also twist the stick for rudder control - or to control more esoteric things like spaceship roll, or swivelling the torso of your in-game Little Friend. 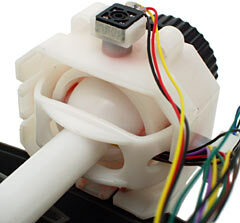 ...you can lock out rotation by turning this little plastic screw head on the base of the hand grip. On the bottom of the joystick, there's a dial that lets you set the stick's stiffness. If you're looking for a really stiffly sprung stick, this isn't it; the Top Gun models are adjustable from "pretty loose" to "on the loose side of medium". But the dial does make a difference, and it's easy to adjust. The Fox 2 Pro, like the other controllers in this comparison, connects to a PC via USB. Modern PCs pretty much all still have a gameport for the connection of old school game controllers, but all good controllers these days use USB, for two reasons. One, USB lets you easily plug in multiple controllers, all at once if you like. Joystick, game pad, steering wheel, all connected simultaneously. You can plug two joysticks into most gameports with a Y-adapter, and you can get switchboxes that let you connect more, but they need to be separately calibrated, games can't tell which one you're using, blah blah blah. It's a pain. The second reason why USB controllers are better is that they've got all of their analogue-to-digital hardware built in. Proportional joysticks almost all use variable resistors (potentiometers) to detect the stick position. Gameport sticks rely on analogue-to-digital hardware in the gameport interface to convert the resistance readings to digital position information. Unfortunately, gameport A-to-D conversion is famously crummy; a lousy gameport will cause the best joystick in the world to suffer from position drift and annoying location spikes. 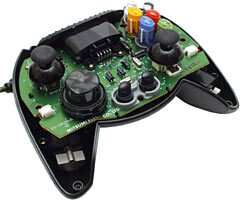 USB controllers have the A-to-D circuitry built into them. They deliver a digital position signal to the PC. If the A-to-D hardware in the joystick is lousy then you'll have the same problems, of course, but it generally isn't. USB controllers are more complex than gameport ones and so cost more, but they're worth the extra money. The Fox 2 sticks also have good supporting software, which lets you configure all of their controls to do pretty much anything that's possible in whatever game you're playing. Many games understand multi-button fancy-sticks natively, but those that don't will need to have joystick functions mapped to keyboard and/or mouse functions. Thrustmaster's "Thrustmapper" utility, for Windows 98SE, ME, 2000 and XP, does just that. In Windows, you install these controllers like a normal USB device, by setting up the software, and then plugging in the joystick. All of the controllers I checked out came with the software on CD, except the Fox 2 Pro, for some reason. It had a "NO CD" thingy printed on one of the inside box flaps, so the disc was clearly meant to be missing. No problem, though; you can download drivers from the Thrustmaster support page. 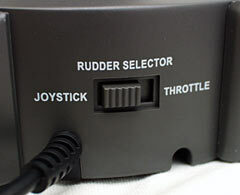 The raw data from all of the analogue features on the Thrustmaster controllers - stick movement, throttle, rudder - ranges immaculately from -128 to +127, according to the WinXP Game Device Calibration widget, with the limits being reached pretty much exactly at the physical limits of the controller travel. So they're well set up, out of the box. How well the potentiometers will hold that setup as they age is a matter for debate. To find out How Much Was Inside the Fox 2 Pro, I pulled it to bits. Here's the bottom of the Fox 2 Pro with its base plate unscrewed. 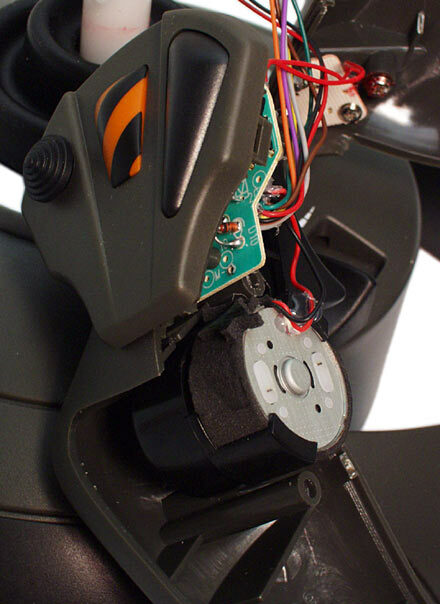 You can see the white-cased stick gimbal assembly in the middle, the throttle slider and its own little pot to the right, and the electronics module in the top left corner. All of the case parts are plastic, but they're tough ABS (Acrylonitrile Butadiene Styrene, the same plastic Lego blocks are made from) and there are enough screw points that everything should stay together well enough. A few little glue blobs and cable ties restrain the wires; it's all quite serviceable. A home hobbyist that could find matching potentiometers could replace the standard ones quite easily, if it became necessary. 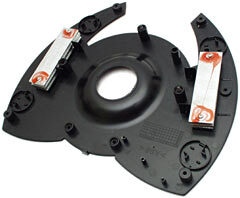 The Fox 2 base plate is made of plastic, too, but there are two stacks of steel weights to give the stick some mass. Some computer peripherals have weights hidden inside because it makes them feel more solid and valuable. 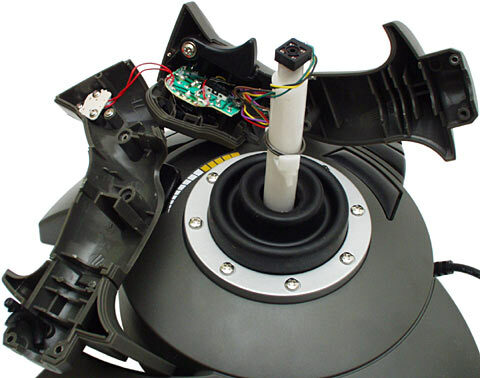 Weights make a lot more sense in joysticks, where a heavier base means a more stable stick. 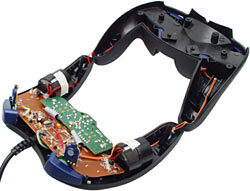 The Fox 2 handgrip's held together with four screws, and isn't terribly difficult to dismantle and reassemble. The trigger has a microswitch, which gives it a nice positive click and should last well, too. All of the other switches on the stick are less satisfying rubber dome jobs, but seem to be decent quality and should last. Note the pot on the top of the white rod that the handgrip fastens around. That what provides the rudder action. Amazingly enough, the grip-twist centring spring is not able to go ping into the corner of the room the second you take the hand grip apart, never to be found again. I find this abnormal design feature mildly disturbing. This is the inside view of the twist-rudder lock at the bottom of the hand grip. It's a simple design that just jams the hand grip against a protruding moulding on the white rod, but it's not as flimsy as it looks; when you try to twist the locked stick, you're trying to crush this thing, not snap it. 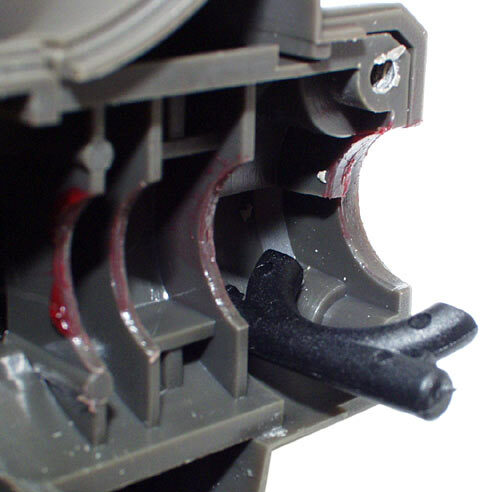 As long as you don't absent-mindedly strip the little plastic screw head by trying to twist it the wrong way, the lock ought not to break. 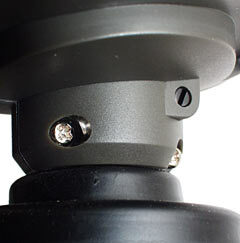 The gimbal assembly at the bottom of the stick. It's all-plastic again, but it's solidly constructed from white nylon, and lightly basted with red grease that should give it good wear resistance. 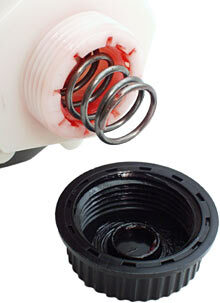 Here's the tension spring arrangement. It's simple, but it works. The gimbal might wear faster with the tension set high; I'm not sure. Now, here's the Fox 2 Shock. 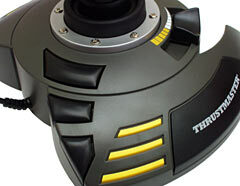 This joystick sells for $AU99 delivered, $AU27.50 more than the Fox 2 Pro. The only difference between the two sticks, besides the colour of their trim, is that the Shock has a shaker motor built into the handgrip. This isn't a proper "force feedback" joystick; true force feedback sticks and wheels can push back against the user, just like real fly-by-cable aircraft controls and real vehicle steering wheels. 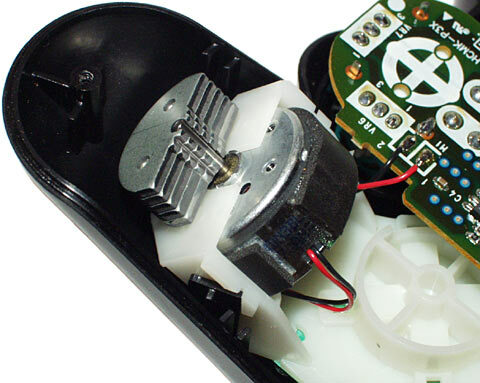 If a controller only has a shaker motor, all it can do is buzz at various frequencies. I'm not a big fan of this feature in joysticks or console controllers, personally. But if you dig it, here it is. Here's the motor inside the handgrip. It's got a bit of foam padding around it to stop it from buzzing too enthusiastically. 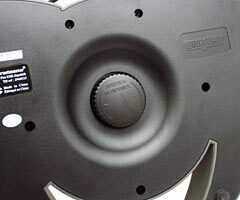 Shaker motors are simple little things - they just spin an off-centre weight to create the vibration. 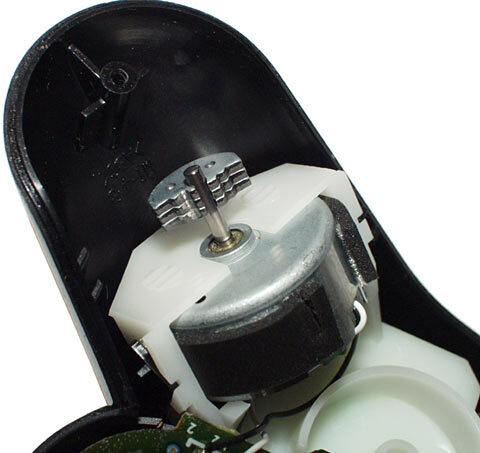 The buzzer motors in pagers and innocent devices for the relief of muscle tension work the same way. Frankly, I have my doubts about whether it's worth paying 1.4 times as much to get a joystick that buzzes. 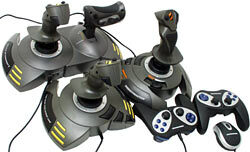 For $AU99 delivered, the Top Gun Afterburner II is a rather impressive piece of game controlling gear. Out of the box, it's all one lump, with its button-crusted left-hand throttle control firmly attached to the right-hand joystick. Look at the underside of the Afterburner, though, and you can see that the two halves can be separated, by undoing two hex-head screws. The Allen key to undo those screws clips into the base too, which is a nice touch. Detach the throttle section, screw on the replacement left-side wing for the joystick section, and you can set up the two halves as you like on either side of your Gaming Throne. There's enough cable wound up on the bottom of the throttle half that you can set the two pieces up about a metre apart, with the cable straight between them. It should therefore be easy to route the cable around all but the beefiest of chairs. 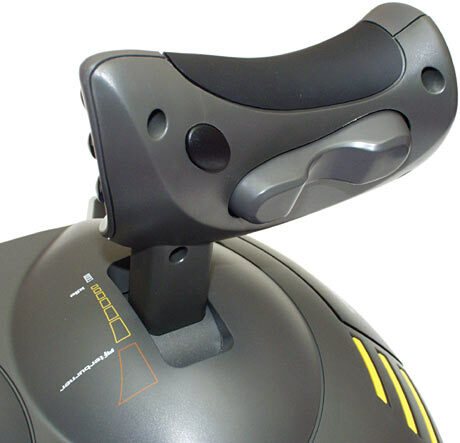 The Afterburner II throttle has two detent spots, which let you set it up in appropriate games to control aircraft engine power realistically. Between the two detents is the normal power range; below the bottom one turns the engine off; above the top one turns the afterburner on. The throttle also has a big rocker switch on the front of it, which you can use for rudder control. The Afterburner II joystick has the twist-rudder function as well, though, and you can only use one rudder control at a time. This switch on the front of the stick decides which rudder works. The Afterburner II actually only has one more control button on it than the smaller Top Gun sticks. 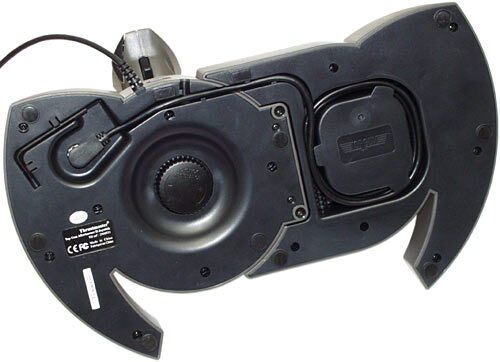 The three buttons on the base of the Fox 2 sticks have been moved to the throttle handle on the Afterburner II, and it's got one more button there as well, but that's it. The extra rudder controller's nice if you want to use it, but irrelevant if you're happy with the twist-stick. 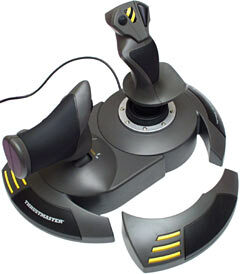 So as far as raw control features go, the Afterburner II doesn't do much that the simpler Top Gun sticks don't. But you've got to love the split design, and it's not as if the Afterburner II costs a fortune. 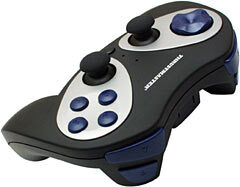 The FireStorm Dual Power gamepad owes an obvious design debt to Sony's Playstation controllers. 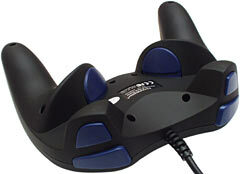 But that's a feature, not a bug, if you've got a PS1 or PS2 and want the same sort of controller for your PC games. For $AU66 you get a solidly built controller made out of that odd rubbery-feeling plastic whose exact chemistry I'm going to have to look up some day. It feels nice, anyway. ...and another six buttons on the underside. As you'd expect, all of the controls are thoroughly configurable with the included software, which once again supports all remotely current game-capable flavours of Windows. I'm not nuts about the feel of the Dual Power's underside buttons; they're a bit squishy and wobbly. The button placement is OK, though, and the top controls feel fine. There are two shaker motors in the Dual Power, for much the same sort of buzzy pseudo-force-feedback that the Fox 2 Shock delivers. Crack the Dual Power open and it's not exactly built like a Dualit toaster, but it'll do. 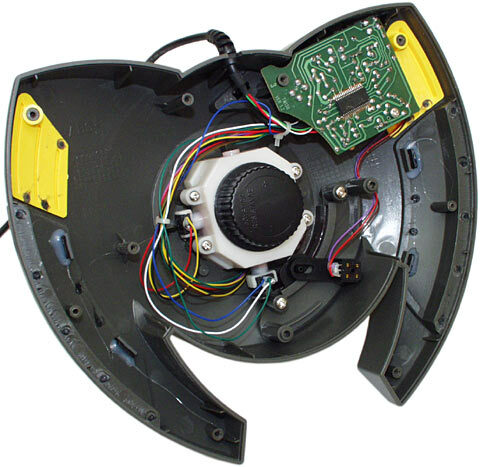 It's solid, the shaker motors are well restrained in their mounts, and none of the button switches (all rubber-dome units) are without support for their circuit boards. I'm not sure whether this gamepad has two identical shaker motors, or ones with different weights - there are covers over the weights. Here's an Xbox controller (you know - the big ones) with the lid off; note that its two shakers have the same setup as the PS2 ones. Different sized weights let the controller create a wider variety of buzzes, which is why the popular consoles use them; I presume the FireStorm Dual Power has them too, but I wouldn't swear to it. The Dual Power has two and a half metres of cable. You might be able to add a few more metres to that with a USB extension lead, but the USB spec doesn't allow for low speed devices like gamepads to have more than three metres of cable, so don't blame me if it doesn't work. You can extend USB up to 25 metres by daisy-chaining hubs, but that's a bit goofy if you just want to play games. 2.5 metres ought to be enough for most purposes. If you just can't stand the idea of cables, though, or if you want to be able to control your PC from further than three metres away without fiddling with wires, then there's the FireStorm Wireless. For $AU82.50 delivered, you get basically the same thing as the Dual Power, only without the shaker motors and the cable. ...except that it's got two tiny switches on the underside, which let you set it to one of four channels. 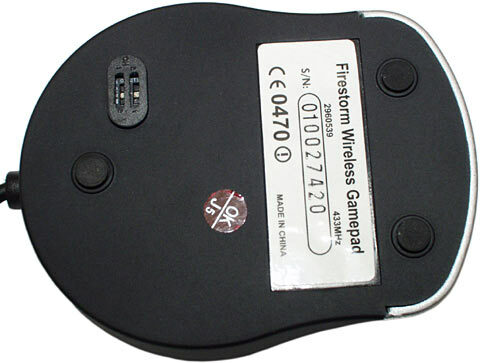 Four FireStorm Wirelesses set to different channels can all be used at once, for very console-esque multiplayer entertainment. The FireStorm Wireless has a matching pair of channel switches inside the battery bay on its underside. It runs from two (included) AAA cells; Thrustmaster quote a 250 hour battery life for alkaline cells, which seems plausible enough. When you're not using the controller, it doesn't flatten the batteries; you only cut into the 250 hours when you're actually playing something. 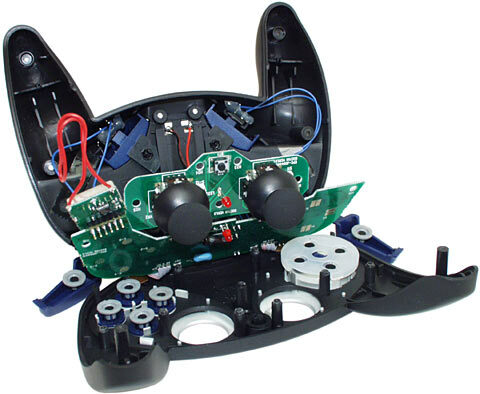 Apart from the lack of a cable and the presence of the battery bay bulge, the wireless gamepad looks and feels the same as the wired version, as long as you don't want vibration. It's made of the same nifty plastic, and the lack of a cable makes it feel even nicer in the hand, if you ask me. Inside, the FireStorm Wireless isn't actually all that busy. It's a high frequency device and so doesn't need much of an antenna. 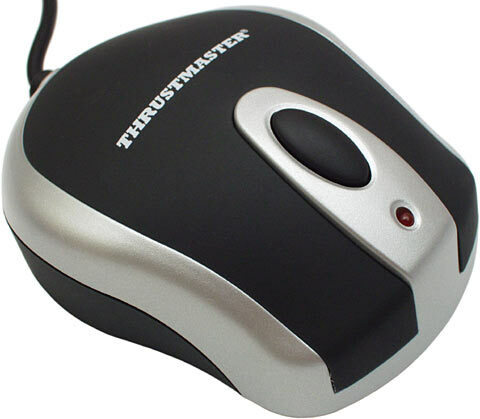 Thrustmaster quote a five metre range for it, which you ought to be able to achieve provided you don't put the receiver in an inopportune place. That's more than enough for most lounge room gaming situations. The Fox 2 Pro, I quite like. Decent price, nice feel, seems solid. The Fox 2 Shock is the same thing plus vibration. If you think the buzz is worth the extra money, and if you play games that support buzzy force feedback (many do, these days), then go for it. I wouldn't, personally. For $AU99 delivered, the Afterburner II is an excellent product. 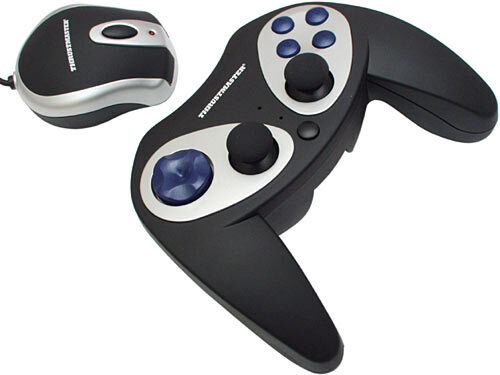 It's obviously not the controller of choice for first person shooters, but it's brilliant for flight sims, space sims, and for Giant Stomping Robot games as well, provided you like aiming with a stick instead of a mouse. This isn't the finest throttle-and-stick combo ever made, but considering the price, you can't complain. The two FireStorm gamepads are solid performers, too. The Dual Power's the better of the two, if you ask me; wireless gaming isn't that much of a feature for most users, and wired controllers don't need batteries. 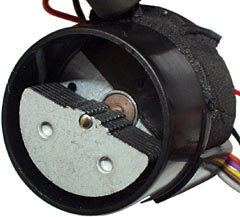 I could live without the Dual Power's shaker motors, but you're not paying a fortune to get them. And you can always disable force feedback in games if you don't care for it, anyway. None of these are bargain basement controllers, but they're not painfully expensive, either. You have to expect to pay at least this much if you want to get a game controller that'll feel pleasant and last reasonably well. These Thrustmaster controllers qualify in both of these categories, and they look good too.